Words matter a lot, even in the financial industry. 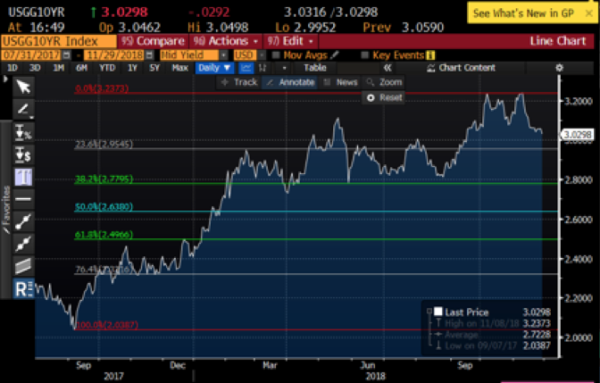 On Wednesday, Federal Reserve Chairman Jerome Powell indicated that interest rates were sitting “just below” neutral, meaning they’re right at that point where they neither bolster nor slow down the economy. Those words sent the stock market skyrocketing, the Dow jumping 2.5 percent after Powell’s speech. In October, Powell had made remarks in an interview saying that interest rates were “a long way off” from neutral. That sent the stock market reeling and was partly the cause of October’s volatility. This week’s speech revealed that Powell and his colleagues have potentially softened their hard-line stance on raising rates. It is still expected that rates will rise in December, however the meeting minutes released this week showed that the Fed does not have a preset schedule for raising rates. Powell is quoted in the minutes as saying, “Monetary policy was not on a preset course; if incoming information prompted meaningful reassessments of the economic outlook and attendant risks, either to the upside or the downside, their policy outlook would change.” While consumer spending was up last month, inflation was stable, sitting right around 2 percent over 12 months, according to the Fed’s preferred PCE gauge (Personal Consumption Expenditures Price Index). With oil prices dropping dramatically, and wages slowly but surely increasing, price pressures are expected to ease. As the stock market soared on Powell’s news, with the Dow posting its biggest rally in eight months, bond prices also went up sending yields down. 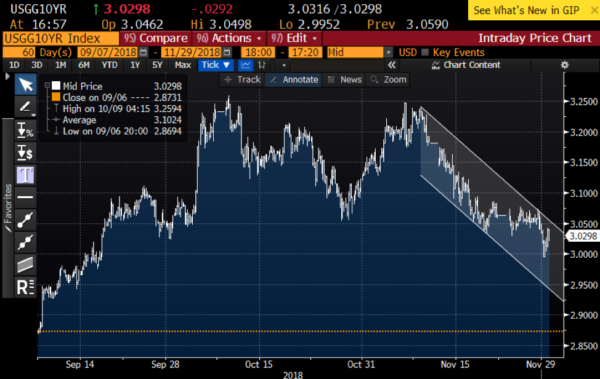 As of this morning, the 10-year Treasury note yield sits at 3.01 percent, pushing mortgage rates down to the lowest level since mid-September. With all the volatility as of late it is worth watching trading technical levels (see graph below). We have been in a downward sloping channel since November with the limits currently at 2.95 percent and 3.06 percent. Resistance would be the 3.00 percent psychological level and the lower channel level of 2.95 percent. With Powell’s latest, more dovish comments this week, I would expect things to settle here for a while absent any weekend surprise (good or bad) at the G20 Summit. 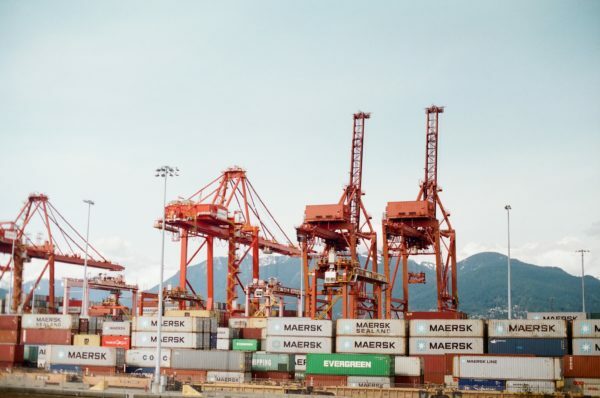 Contributing to the Fed’s softer approach is the uncertainty surrounding trade tariffs. President Trump is in Argentina this weekend for the G20 Summit. This could be a crucial weekend for domestic companies as it’s expected Trump will discuss trade tariffs with China’s President, Xi Jinping. The concern is that the rising debt of domestic companies will get passed on to consumers, further contributing to harmful inflation. Coinciding with Trump’s G20 trip is a report that Americans aren’t as optimistic about our economy’s future. For the first time in five months, consumer confidence dropped from 137.9 to 135.7. When you see the drop on a chart it looks fairly insignificant considering we’ve been riding an 18-year high. The problem, according to analysts, is that while Americans believe they can find a job, they just aren’t sure they’re going to get paid enough. The higher mortgage rates, though still well below what would be considered average, have stymied the American housing market. According to the Commerce Department, new home sales dropped nearly 9 percent last month. The seasonally adjusted annual rate for October was 544,000 units which is the lowest level in nearly three years. While September’s sales were revised higher, new home sales have still dropped in four of the last six months. The Commerce Department also noted that the median new house price was down to $309,700 in October, a slide of 3.1 percent. Home price gains overall are not going down just yet, but they are certainly slowing. The latest Case-Shiller home price index shows that year over year growth has slowed to 5.1 percent. That’s the slowest rate of growth since January of 2017, which is nearly two years ago. Additionally, growth slowed to 5.5 percent in September down from 5.7 percent in August. An article in CNBC noted that, in Seattle, “22 percent of listings are at a reduced price and—for the first time in four years—a buyer was able to negotiate to buy a house for less than the listed price.” The largest factor in the reduced rate of growth is rising interest rates, with the rate on a 30-year fixed mortgage a full percentage point higher than last year. The remaining problem with the growth is that, while slower than a year ago, home price gains are still almost double the rate of wage gains for Americans. Nine cities saw declining prices in September compared to August, including Chicago, Denver, Los Angeles, Washington D C. and San Diego. 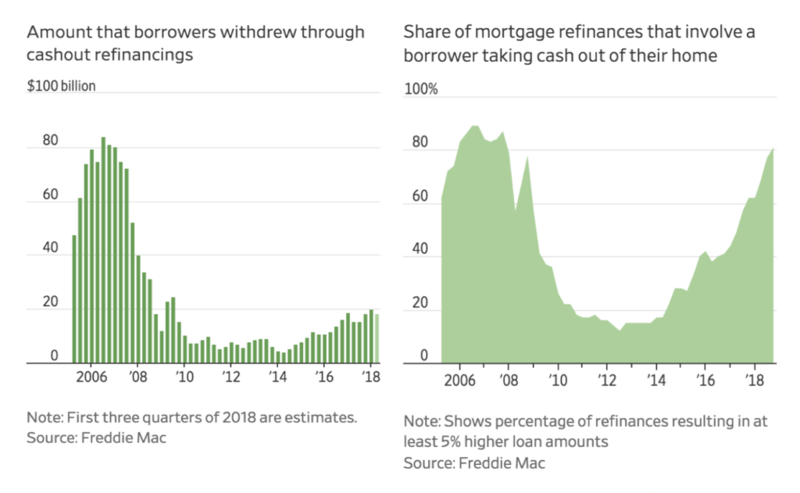 A disturbing trend from the pre-crash era has made another appearance in the housing refinance market in 2018. As we mentioned earlier, home prices are still almost double the rate of wage gains. While that’s pricing a lot of people out of homeownership, it also means most people probably have more equity in their homes than in their bank accounts. So when big bills come up, like paying for school or paying off a credit card, people are choosing to cash out that equity despite interest rates getting higher. 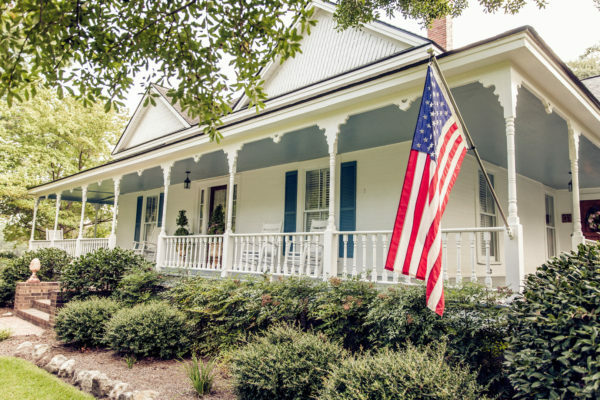 This is not near the levels of activity we saw in 2006 and 2007, but in the third quarter of this year more than 80 percent of borrowers chose to cash out equity, according to Freddie Mac. Those homeowners in the third quarter took more than $14.6 billion out of their home’s value. That is something Americans haven’t done since 2007. It is best to be cautionary with cash-out refi’s as we are seeing a slowdown in home price gains. In 2007, many Americans who cashed out ended up owing more than their homes were worth which was a large part of the housing collapse. This entry was posted in Business, Real Estate and tagged Home Buyer, Mill City Realty, NH Real Estate. 👏🏻 Congrats To My Clients!